The men's and women's field has the potential for some very fast times and exciting racing. Last year, Alistair Brownlee (GBR) kicked off his 2018 season with a win and a 3:35:30 finishing time at Ironman 70.3 Dubai. Brownlee used his 22:35 swim split, sub-two-hour bike and mind boggling 1:09:34 half marathon to take the overall win. In the women’s race, it was another blazing half marathon time of 1:14:11 from Anne Haug (GER) that would be the defining moment of the race and the race winning move. Britain’s Holly Lawrence spent most of the day in the lead, but Haug proved to have another gear in the run as Lawrence slipped to third. Fellow Brit, Sarah Lewis came second. The 2019 edition of the race has the potential to be just as fast, if not more. In the men’s race, Brownlee returns to defend his title and he’ll have to do it against Kristian Blummenfelt (NOR). Blummenfelt closed out the 2018 season with a world best time of 3:29:04 at the Ironman 70.3 Middle East Championship in Bahrain. The Bahrain Endurance 13 triathletes, Brownlee and Blummenfelt, will have to keep an eye on Adam Bowden (GBR). At the 70.3 Middle East Championship, Bowden finished behind the Norwegian sweep in 3:35:03. On the women’s side, it will be a showdown of last year’s podium – Haug, Lewis and Lawerence. Earlier this week, Cervelo announced their newest athlete signing – Anne Haug. With a new bike, Haug will hope she can stay in striking distance of Lawerence – a proven threat in the swim and bike. 🚴‍♀️ Many of you have been suspecting it. Excited to be supported by a new bike sponsor @cervelocycles from 2019 on! 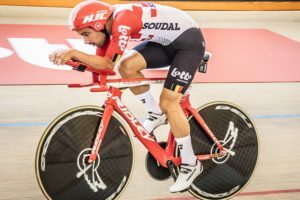 💣 "Fast, faster, Cervélo. I´m so proud to be member of the Cervélo Familiy from now on. 🌬The company which sets the benchmark for years in terms of aerodynamic and stiffness. Can´t wait to be "simply faster" together this season. 📰 Interview in Bio. Having spent most of the 2018 season out with a stress fracture, Lawerence returned to racing with a win in Bahrain at the 2018 70.3 Middle East Championship. With a few more months of training under her belt, the 2016 Ironman 70.3 world champion is a threat for the win in Dubai. Lewis was also at the race in Bahrain and was oh-so-close to catching Lawerence at the line. The pair finished less than a minute apart from each other. The race begins Friday, Feb. 1st at 7 AM GST (Jan. 31st 10 PM EST).